Stylish and graceful, Grace is a bouquet which will please the eye of the beholder with its creamy white Roses, bright white Oriental Lilies and a splash of orange coloured Gerberas.The vase in the picture is not included, however if you would like to make your flower gift extra special, why not add a vase to your order? We recommend a Premium Vase to leave a lasting impression. I clicked on the repeat order because I am NOT a New customer but already many years client!! I hoped you would not send exactly the same flower arrangement As last YEAR ! But she was happy with it!! 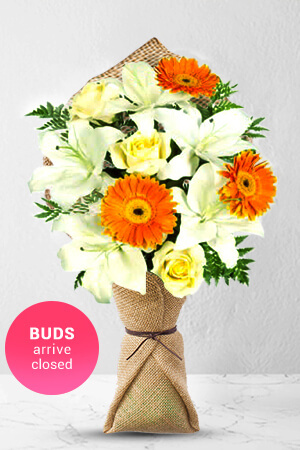 the ordering of flowers online was easy. The reminders leading up to the date were helpful. However, the only thing I didn't like was the mutiple emails from zFlowers.com and Tom Hegarty after I made my purchase. it was overkill and annoying to receive so many emails. Thank you so much for all your help in getting my flowers delivered, also the phone calls to me in Canada to make sure everything was correct!! Flowers were easy to order, choice was great and, most importantly, my friend was delighted with them. I found the website easy to use. The flowers were delivered on time and the recipient loved them. I like the fact that you can attach a reasonably lengthen message to the card accompanying the flowers. Thank you for the prompt service and beautiful arrangement.